On the anniversary of the shocking suicide of their classmate Laura Barns (Shelley Hennig), teenage girl, Blaire (Shelley Hennig), and four of her friends are stalked by an anonymous online figure. This malicious presence seeks the truth about a video posted before Laura’s death and will stop at nothing to wreak its horrific vengeance. Discover Amazing Films Every Week - Just Click Here! Horror movies often reflect the unsettling fears and anxieties of their society. It is unsurprising, therefore, that the dark side of the internet and social media should inspire a new genre of screen-based scary movies. Unfriended is not the first to venture into this terrifying territory, of course. However, director, Levan Gabriadze’s, film succeeds where others have failed because it understands online culture and why we cannot walk away from our screens. Granted, Unfriended isn’t a particularly scary film. However, it is effective and innovative. Gabriadze builds his tension by keeping the movie’s action locked within the confines of Blaire’s computer. We see her typing and receiving instant messages, watching videos and chatting to her friends via Skype. Desperately trying to stay one step ahead of the horror, Blaire switches between screen windows, as familiar online alerts take on an increasingly menacing air. 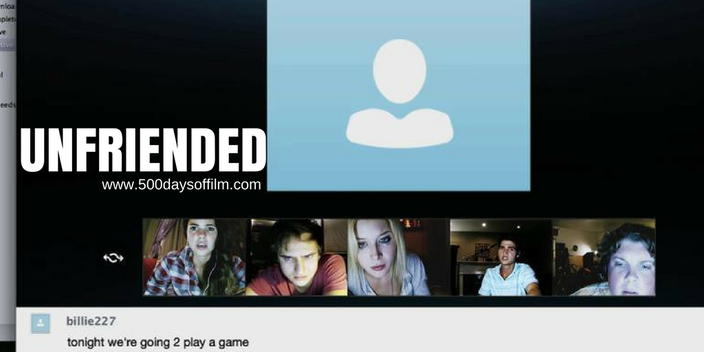 While Unfriended’s conclusion offers few surprises, the concept behind the film’s horror lingers: thoughtless acts on social media have lasting consequences. I felt uneasy about Unfriended after watching Netflix documentary Audrie & Daisy. Teen suicides after social media shaming are becoming all too common - should they, therefore, be the subject of popcorn entertainment? However, Unfriended throws some much needed light on the subject and I felt that the film’s message is necessary - a cautionary tale for our times. If you have, what did you think about this horror movie? Do let me know by leaving me a comment in the box below!